I’m very excited to share the eighteenth episode of the Woolful podcast. 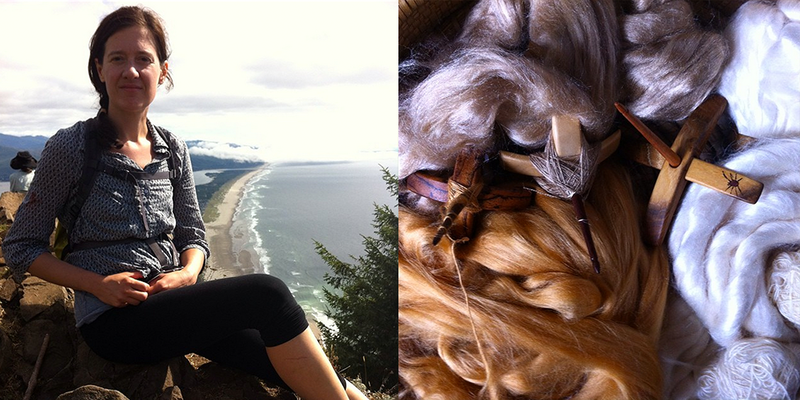 Today we get to meet and hear the journey of a fascinating weaver from the Pacific Northwest, Ashli Tyre. 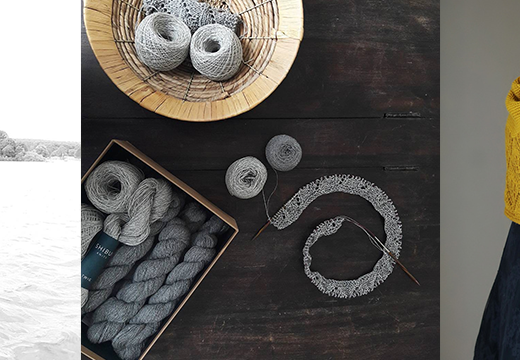 Fiber folk: I first came across Ashli’s work via Instagram awhile back when I was mesmerized by her weaving and one day my friend Kathy sent an email sharing a bit of Ashli’s special story, process and a photo she’d taken, thinking she’d be a beautiful addition to the podcast. I couldn’t agree more. 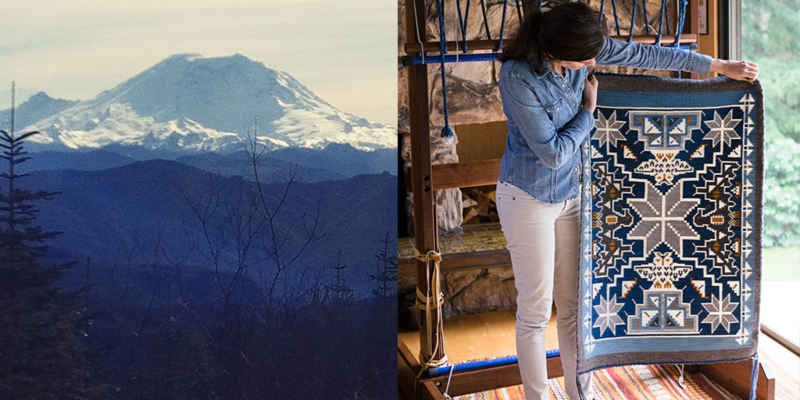 Much of Ashli’s inspiration comes from a very special place, the Pacific Northwest and in particular, Mount Rainier. Her approach and dedication to process, from wool selection, to natural dyeing to spinning and weaving, is just incredible. You can find Ashli at ashlityre.wordpress.com and on Instagram @ashlidtyre. Man on the street: For this week’s “Man on the Street” I asked a question, shared by Mary in our Raverly group. 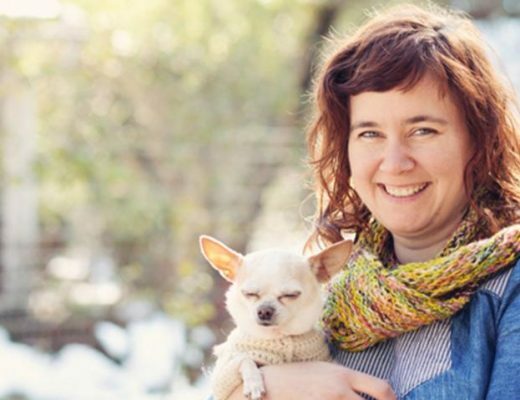 “Why do you knit?” We had a great reply from Cady @cadysinks. Giveaway: The winner of last week’s giveaway, is Michelle Kirkland! 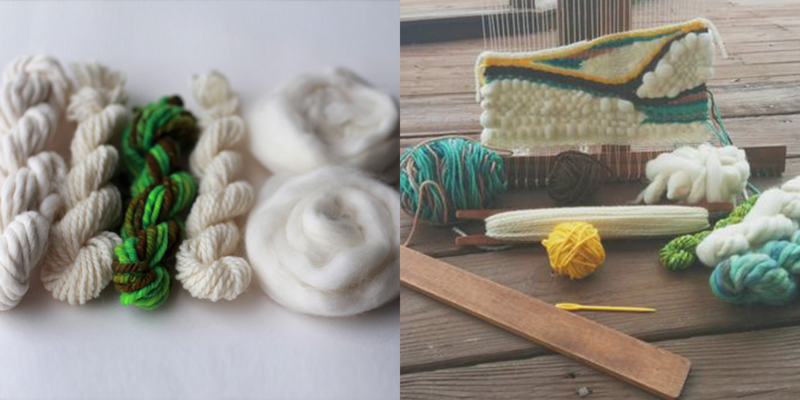 You’ve won two skeins of White Gum Wool in Flax Lily! Congratulations! The giveaway this week is sponsored by Serene Fiber Arts, and we’re giving away a weavers fiber pack, which includes a variety of handspun, bulky and aran mini skeins and a couple bumps of merino roving. Can’t wait to listen to this podcast. I’ve been dreaming about trying tapestry weaving! So very excited about this week’s podcast! I am fascinated by weaving but have yet to try it, mainly because I have operated for years under the false assumption that it required acres of space and storage for all the equipment and supplies. Thanks so much for keeping this lovely podcast running! LOVE your podcast. So happy to have you to listen to! Wow – those navajo weavings loook amazing!!! really, really, really can’t wait to hear this podcast! Keep ’em comin’ ashley! Your work is so beautiful Ashli! Yet more inspiration to give weaving a try. 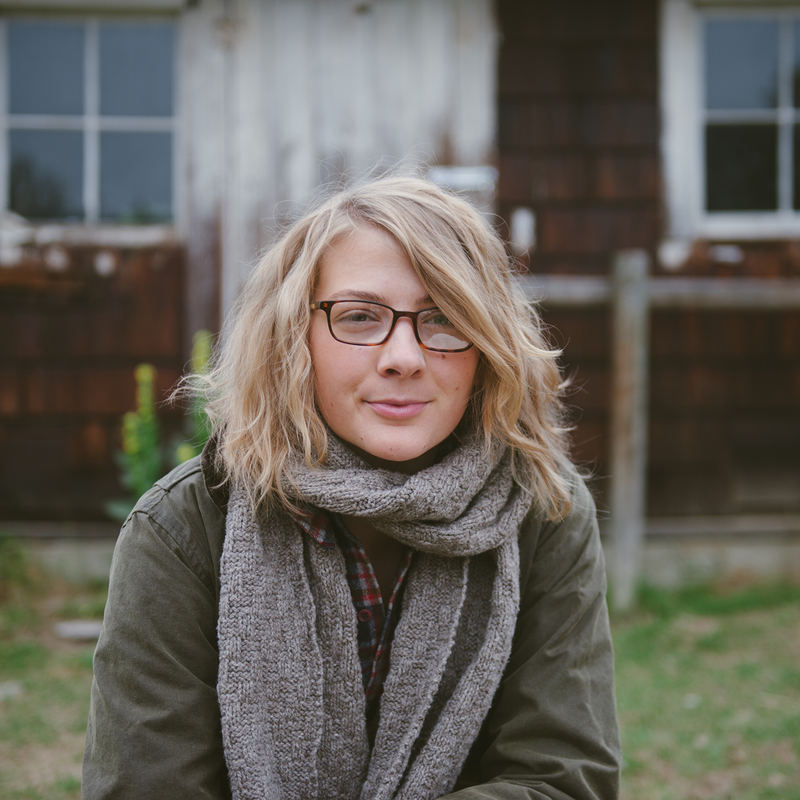 I love the stories behind your big rugs and it was also refreshing to hear that the creative process isn’t always a smooth and easy one for you. I too so much more enjoy the ‘doing’ part, the planning on what to do can be more stressful for me as well. Thanks for sharing your story. Have just listened to Podcast 18 and now looking forward to listening to this one especially about the natural dyeing and weaving. I love Ashli’s love of the processes behind her work. In a world of immediate gratification, it is so refreshing to hear others who value the process. I grew up in Maine, but I have never been to Port Fiber. It is on my list to visit the next time I am home! 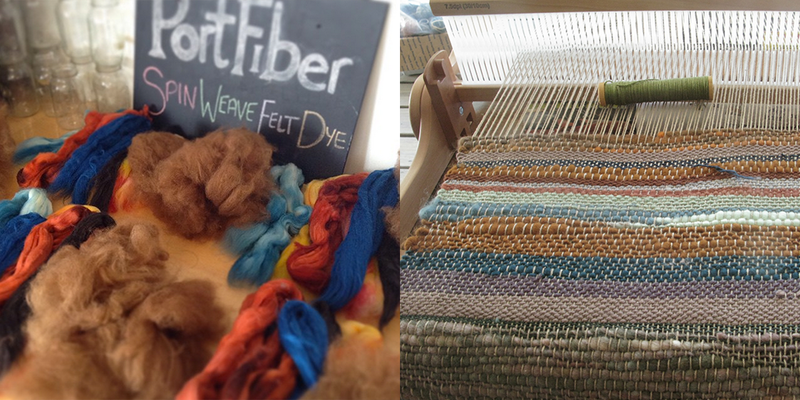 Thanks so much for doing a podcast on weaving and expanding the topics on fiber. Taking it to the next level by talking about felting and even paper would be cool. I’m sure the papermakers could learn a lot of great stuff on natural dies from other fiber workers. But, exploring the Asian intersections between paper and yarn/cord arts would be awesome. Jeseung is the Korean art of basket weaving with paper cords and Joomchi is a way to felt paper. Looking forward to greater explorations of fiber possibilities with the podcast. Another inspiring podcast. Thank you so much! New listener, and I love your podcast! Thank you! As a weaver, i was very interested to hear this interview and see the beautiful tapestries. So much to learn! I feel like weaving is calling me. I knit and spin and would love to add the skill of weaving to my life. This episode was truly inspiring and I love the “in love with the process of making” mindset Ashli has. Ashli is AMAZING. Now I want to weave! This was my first time listening, and wow! I can’t wait to go through and listen to all of your previous episodes. So much wonderful information to soak in, thank you so much! Very inspiring work! Have been hoarding a 4-shaft table loom in my basement, waiting for the child to grow up and go to preschool…that’s when I’ll have all the time in the world, right? 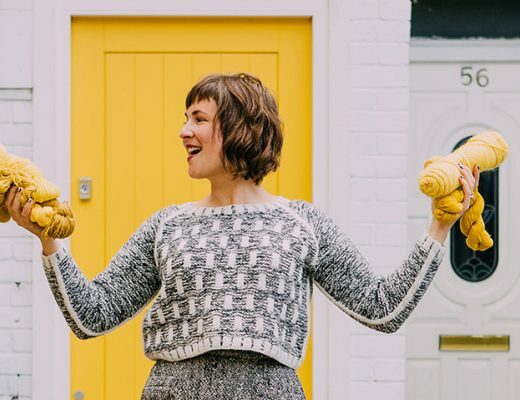 My fiber journey has recently taken me to weaving, so I was really excited to listen to this podcast. 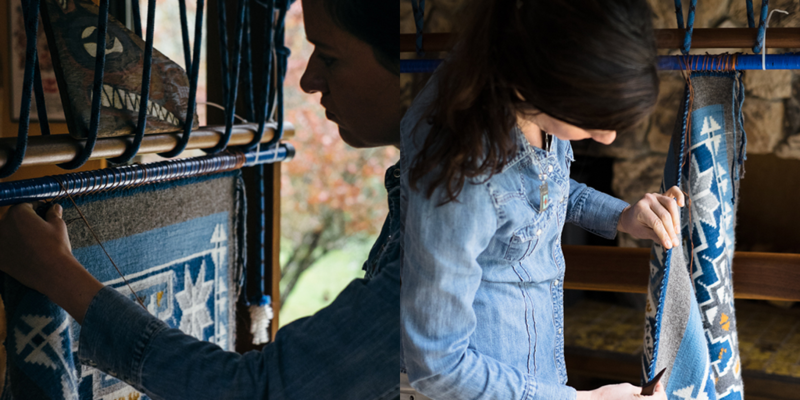 It’s so inspiring to hear Ashli’s weaving process from beginning to end. Someday I’d like to take a fiber-batical! What an incredible amount of work goes into making those woven rugs. Thank you for sharing. Thank you once again for an amazing podcast! I found it very inspiring to listen to Ashli and hope to learn to weave now. I am very impressed by Ashli’s dedication to her craft. I really enjoyed listening to her describe her method and process for weaving each piece. As a hiker, I absolutely loved hearing her stories about Rainier and how it influenced her designs. Thanks for another great podcast. I look forward to hearing more about your ranch happenings. How awesome it must feel to be getting your first few animals, building structures, etc! Best of luck! What an inspiring story. I wish I could see her tapestries in person. They look amazing! Another fantastic episode of your podcast. I love it so much and this episode was another glorious edition. Thank you so much. I’m so impressed by her work – wow!! Yet another fabulous episode. Thank you. my newest addiction is spinning and who would think anything can steal me from knitting. Would love to win this giveaway!! This podcast inspired me! I loved Ashli’s story. I only recently discovered your podcast – it’s great! Thanks for another great podcast, Ashli’s work is beautiful! My adopted grandmother is Navaho and I always enjoyed checking out the loom set up in her livingroom. I’d love to hear more about specific native coloring and weaving techniques. I’ve always wanted to try my hand at weaving, so thank you for this podcast! Love that Ashli is from my area. I would love to connect with and learn more from her! Keep up the great work. I savor your podcasts! Looking forward to catching up on these podcasts. Such an interesting variety of people you are interviewing! Ashli’s story is so inspiring. The Navajo rugs are beautiful. I’d love to try my hand at weaving! I think it would be a great use of my small amounts of handspun yarn. Thank you for another great podcast! I appreciated learning how much work Ashli puts into her weavings before even touching a loom. How inspiring to slow down and really follow whatever is speaking to you. I’ll try my luck, and hope I’m not too late. Thank you for another wonderful podcast, which inspires and opens our horizons. Enjoy your adventures at your ranch. Love your podcast, just finished episode 18 and looking forward to 19! I just found your podcast, and I’m so glad I did. It’s nice to have such a soothing listen, and to hear folks talk about their process and inspiration. I’m a knitter who knows a wee bit of crochet, but I’m starting to research spinning and dyeing and weaving, because I love understanding the whole process and I want to fully know how the components come together. Thanks for sharing! Love this podcast! You could feel the inspiration behind the weaving! Makes me want to give it a try! Would love to win this week’s prize! 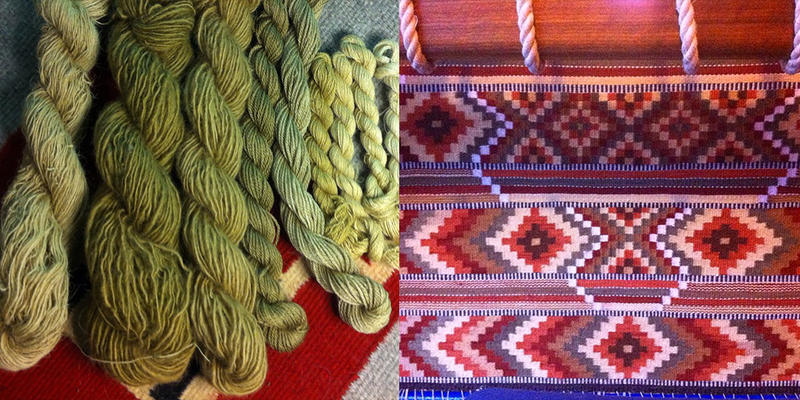 2016 was to be my year to dive into weaving, but there’s no reason not to get started earlier! I am so glad you are having sessions on weaving too! I am only at the rigid heddle loom stage in my weaving journey, but its an amazing craft! Thanks for a great blog! I visited a fibre studio in Granville Island, Vancouver, BC last December, and there was a tapestry loom set up, with stacked baskets all around filled with the most amazing varieties of yarn sorted by colour. I had never even considered weaving before that, but my interest has now been thoroughly piqued! What beautiful weaving! I’ve been primarily a knitter for the past dozen years, but loved the weaving class I took in college ages ago. While I don’t have room for a large floor loom, I’ve been thinking that I need to find a way to bring some smaller scale version into my life. To enter the giveaways we just leave a comment? I have only recently discovered this podcast. I am slowly catching up as I knit or spin and cannot wait to listen to this one as I am going to have a go at saori weaving next month. So interesting to learn more about weaving. I think it’s definitely something I’d like to experiment with. Thanks so much for sharing and inspiring! I very much enjoyed Ashli’s story and getting to see some of her work. I’m a spinner as well and more recently a weaver on a floor loom, but know that I will do some work with tapestry at some point. I appreciated the comments on dyeing as that seems likely to be one of my next steps in my fiber journey. I met Ashli a few months ago so I found this podcast to be extra special. 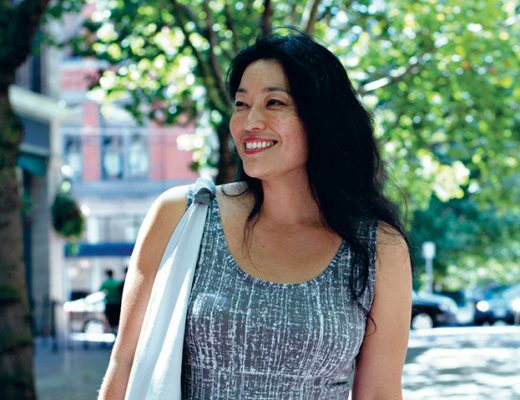 It’s so fascinating to learn so much about her fiber journey. Keep up the amazing work! I recently found your podcast and have been loving it. You are so inspiring. Thank you! I love your podcast. It makes me dream of trying my hand at dyeing and spinning and one day owning sheep! One of my favorite episodes so far! Great show, and I was struck by the respect the artist so obviously has for the origins of her craft without feeling that she shouldn’t participate because it’s not her culture of origin. There was an Instagram discussion about cultural misappropriation because a recent knitting magazine included Native American color schemes and designs, and it just seemed odd to me–there is only respect, and continuity of tradition there, to me. We creatives imitate because we love and are inspired by those who come before us in the craft, and because our hands feel what our hearts know and our minds so often mess up: there is a language of beauty, and we all speak it. Can;t wait to hear more about the weaving… this in on my birthday list! Enjoying your interviews. You are introducing me to new worlds of fiber. Thought you might enjoy this one from On Being. She’s using crochet to visualize concepts of science. Another great episode! I’m big fan of these recent episodes being a bit shorter. I’ve been waiting to hear Stephen interviewed! Great choice! LOVE Stephen West! Especially his love of color!!!! I can’t wait to listen to this one! Another wonderful episode – thanks for what you do! I’ve been wanting to make a tank! Love the podcast! 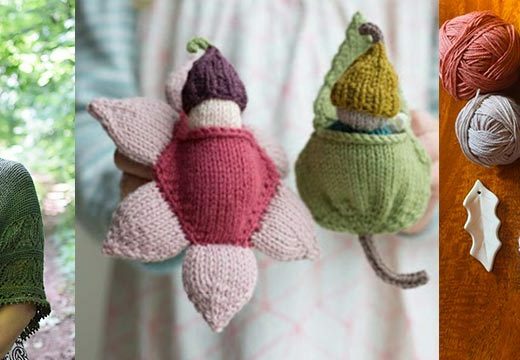 Would love to win this giveaway and try out Stephen’s patterns AND my sewing machine! This episode from Ashli has been my favorite. I listened twice!